Bandicam is a software package that is able to record game play and screen recording videos, all in a lightweight package. With Bandicam, you can record a specific area on a PC, or capture gameplay that uses one of many common graphics technologies. Bandicam uses a high compression ratio without sacrificing video quality, and claims to provide superior performance as compared to other popular recording softwares. This software also makes it possible to record ultra-high definition 4K video with a capture rate up to 120 frames per second, and provides a hardware accelerated h.264 encoder. Bandicam also allows for image capturing in BMP, PNG and JPEG format, and can offers a continuous image capture mode. Here's the Bandicam best settings tutorial video: How To Record Games With No Lag or FPS Drop! Summary This mode allows you to record your gameplay without lag while showing FPS. This mode allows you to record everything on your computer screen. This mode allows you to record external video devices. Recording target Various 2D/3D games, iTunes, Windows Media Player, HDTV, other 3D applications. Computer Screen, PowerPoint, Excel, Web browser (IE/Chrome/Firefox), Flash games. A Webcam, Xbox/PlayStation, Smartphone, IPTV, Capture card, etc. Pros This mode offers a better quality recording than 'Screen Recording' mode. This mode allows you to record your full screen or a certain area of the computer screen. 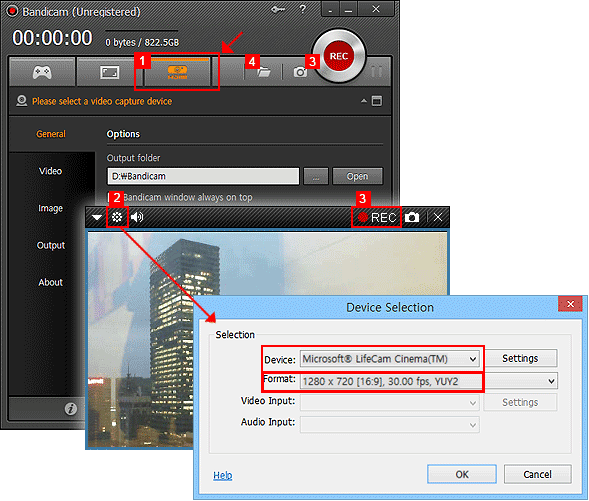 This mode allows you to record a webcam, Xbox/PlayStation, IPTV in high quality. Cons It doesn't allow you to record your computer screen, PowerPoint, etc. It is not suitable for recording high-quality games/videos which have high framerates. You need a webcam or capture device (hardware). 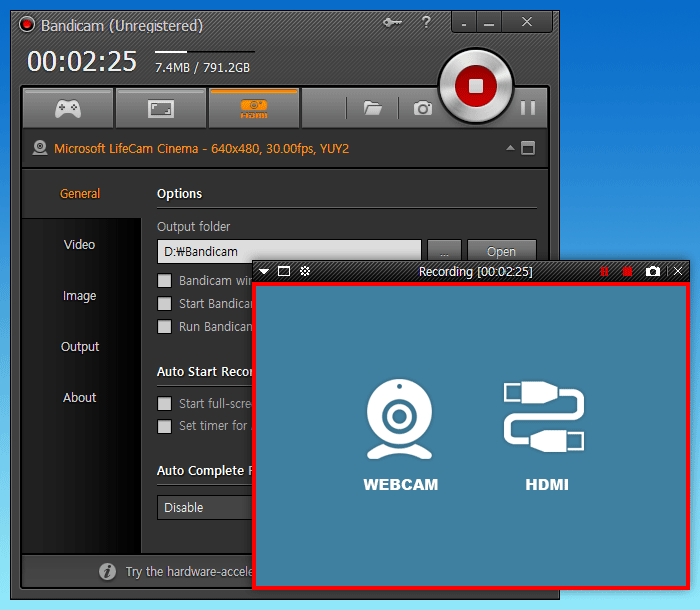 Bandicam offers three modes of operation: "Game Recording," "Screen recording," and "Device Recording." In Game Recording mode, you can record gameplay and show your frames per second, all without any latency. This mode works best with most games, specifically ones that use DirectX, OpenGL, or Vulkan graphics technologies. It is also compatible with iTunes games, Windows Media Player, most webcams, HDTV, and other 3D applications. It records high quality video, but can be a little difficult to use. This mode results in a better quality video than Screen Recording mode does, but it will not work for recording your entire screen, Powerpoint presentations, or other similar applications. 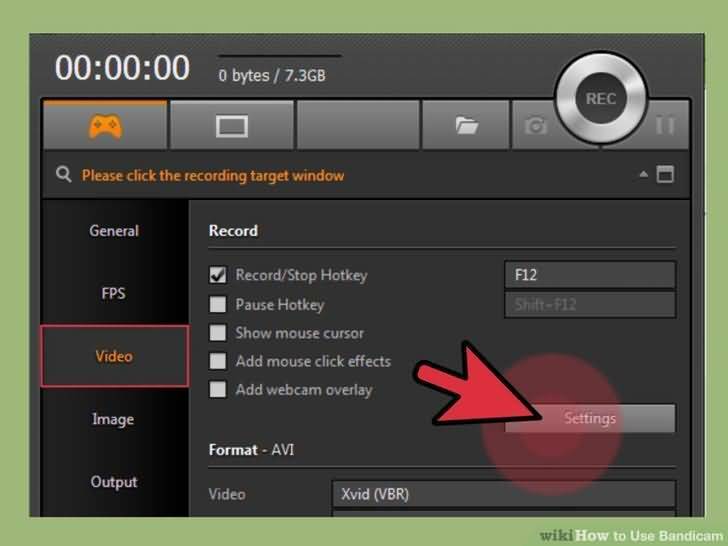 Screen recording mode allows you to record everything on your computer screen. In this mode, you can record just about any target including your entire screen, Powerpoint presentations, Excel spreadsheets, your web browser, Flash games, and more. As mentioned above, the quality is not as good as Game Recording mode, but it is much easier to use. It is not suitable for recording games or videos that have high framerates. Device recording mode allows you to record video from external sources, like a webcam, game consoles, smartphones, capture cards, and more. This mode yields a high quality video, but can be a bit more difficult to use. While this mode has the advantage of allowing you to record high quality videos from external devices, it does require that you have additional hardware. For best results on game console recordings, you will want to purchase a PCI/PCI-E capture card, or have a USB capture card that is compatible with USB 3.0 and the requisite port on your computer. You will also need to make sure you have the correct drivers installed for your devices. Bandicam has integrated support for uploading your captured video to YouTube. Bandicam compresses the video as it is recording, which results not only in better gameplay performance, but also in much smaller final file size.This means you can upload the video to YouTube without further conversion. You can record superior quality, 4K Ultra HD video with resolutions up to 3840 x 2160 with a maximum frame rate of 120 frames per second. This software uses much less of your valuable CPU, GPU, and HDD while recording, which as previously mentioned, results in little latency. The integrated h.264 encoder allows for an optimized recording performance, and allows for over 24 hours of straight gameplay recording. Players can view the frames per second being captured, and adjust it while they are playing. You can also record any sound sourced from your computer while playing, plus any audio feedback you may wish to provide using a microphone, with the "Two Source Mixing" option. Bandicam supports AAC, MPEG-1, and PCM audio codecs, and AVI/MP4 media formats. It is also compatible with the Nvidia CUDA/NVENC H.264 encoder, the Intel Quick Sync video H.264 encoder, and the AMD VCE H.264. Continuous image capturing supports BMP, PNG, and JPEG image format. Gamers have commonly used Bandicam to record gameplay from Battlefield, Call of Duty, Runescape, Skyrim, Team Fortress 2, Overwatch, Minecraft, League of Legends, and more. All of these features are available for just $39 for one license, or $59 for two licenses. A lighter, more restricted unregistered version is available for free, but limits recordings to 10 minutes per file, and places a watermark on the recording. Bandicam also offers a separate video editor. Much like their recording software, they offer both a free version and a full version. Unlike with other software recording packages, this software is not bundled, by default, with the recorder, but is offered at a reduced price when bundled. Not bundled, the editing software is $29 for a single license, and $44 for two licenses. The free version will place a watermark on the video. Bandicam claims to offer less latency than other recording, but there is noticeable lag at the beginning and end of each recording. It does, however, hit the mark when it comes to high quality recordings, and includes any settings you might need to make your recordings top notch. This software does a great job of balancing depth and breadth, offering a satisfactory selection of tools, while keeping them efficient and easy to use.